Species listed. Unless otherwise noted, species names are according to Crother (2012). Following the main list is a list of species reported in the ‘Observed and Expected Fauna’ in the 1999 EIR but not confirmed by observation. Photos and descriptions. Links labeled ‘BFS’ are pages created for the Bernard Field Station. Photos on the BFS pages may be used for any personal or academic purposes as long as notification of use is sent to the BFS Webmaster and the image is clearly credited with ©[Name of photographer]. For higher-resolution images, please contact the photographer. Note that no photos taken at the BFS may be used for commercial purposes without the express permission of the Claremont University Consortium. You must have pop-ups enabled to view the BFS pages. Links labeled ‘WERC’ are to species accounts in A Field Guide to the Reptiles and Amphibians of Coastal Southern California by Robert N. Fisher and Ted J. Case, available online from the the USGS Western Ecological Research Center. San Diego Natural History Museum Field Guide to Reptiles and Amphibians includes descriptions, ranges and habitats, natural history, and consevation information as well as photographs. Reptile species accounts in the Western Riverside County Multi-Species Habitat Conservation Plan. ZOO 429L Images - Herpetology Laboratory, Cal Poly Pomona, by Glen R. Stewart, Professor Emeritus, has many photos, but not descriptions. 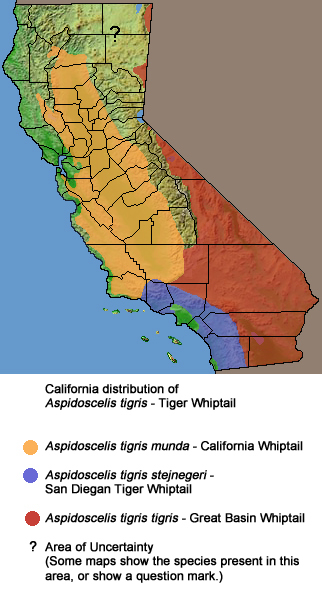 CaliforniaHerps.com, an amateur site devoted to California's reptiles and amphibians, has many photos, including habitat photos, as well as range maps and references. Reported in the 1999 EIR as Anniella pulchra pulchra, but A. p. pulchra and A. p. nigra are no longer recognized as separate subspecies. Originally reported as Cnemidophorus tigris multiscutatus; however, in 2001 the coastal Southern California species was assigned to C. t. stejnegeri, and in 2003 the species was assigned to genus Aspidoscelis. The Field Station Manual reported the whiptail on the BFS as C. t. mundus (now A. t. munda), but this identification is almost certainly in error — see range map. Phrynosoma blainvillii was until fairly recently considered a subspecies of Phrynosoma coronatum; however, in 2004 it was elevated to a separate species. Formerly Eumeces skiltonianus skiltonianus; now assigned to genus Plestiodon. Reported in the 1999 EIR as Sceloporus occidentalis biseriatus, but the subspecies designation seems unlikely given its range. Reported in the 1999 EIR as Uta stansburiana hesperis, but this subspecies is no longer recognized. Originally reported as Masticophis lateralis lateralis, but now considered to be in genus Coluber. Originally reported as Hypsiglena torquata klauberi; assigned to H. ochrorhyncha supspecies klauberi in 2006. Originally reported as Pituophis melanoleucus, but this species is now restricted to the related Pinesnakes found in the Eastern U.S. Previously reported as Clemmys marmorata pallida; now assigned to genus Actinemys. The subspecies pallida is no longer recognized. Not native to Californai – introduced, especially in populated areas, primarily as a result of the release of pets by negligent owners. Previously reported as Bufo boreas halophilus. The genus Bufo was recently determined to be paraphyletic; North American toads are now placed in Anaxyrus. The subspecies pallida is no longer recognized. Exotic. Native to the Eastern U.S., L. catesbeianus has now been introduced into many places in the Western U.S., including California. Formerly Rana catesbeiana. Listed in the 1999 EIR as Hyla regilla; now placed in genus Pseudacris, and the Pseudacris in our area has been determined to be a distinct species from P. regilla. Listed in the 1999 EIR as Batrachoseps pacificus major; however, recent revision elevates this taxon to a species, B. major, with two subspecies. Originally reported as Masticophis flagellum piceus, but now assigned to genus Coluber. Rattlesnakes have been extirpated from the BFS. Listed in the EIR as Crotalus viridis helleri; now assigned to C. oreganus. Originally reported as Lampropeltis zonata pulchra, but subspecies of L. zonata are no longer recognized. Formerly Leptotyphlops humilis humilis. Leptotyphlops is now restricted to old world species. Formerly Trimorphodon biscutatus lyrophanes; now a separate species. USFS = US Forest Service “Sensitive” according to their 1998 list. A new list should be forthcoming soon. BFS = Robert J. Bernard Biological Field Station. Some of the reptiles and amphibians were photographed at the BFS. Additional photographs taken elsewhere have been generously provided to the BFS by Claremont Colleges faculty, students, and staff, and additional photographers. Crother (2012) = Committee on Standard and Scientific Names, B.I. Crother, Committee Chair. 2012. Scientific and Standard English and French Names of Amphibians and Reptiles of North America North of Mexico, with Comments Regarding Confidence in our Understanding., 7th ed. Herpetological Circular No. 39. Society for the Study of Amphibians and Reptiles. EIR = Envicom Corporation. 1999. Draft Environmental Impact Report for the Claremont Colleges North Campus Master Plan. March 1999. Page last updated 3 December 2012 by Nancy Hamlett.